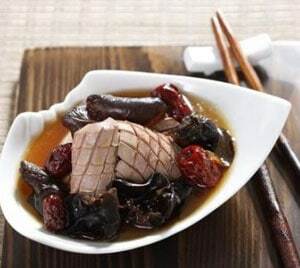 Pig’s Kidney and Pork with Dom Benedictine (郎酒炒猪腰梅花肉) is suitable for new mothers during the confinement month to help them regain their energy, improve blood circulation and strengthen body function. 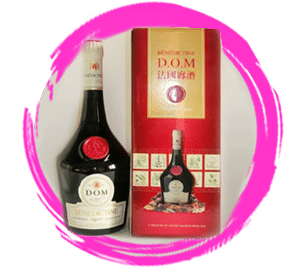 Dom Benedictine helps to fight fatigue and has properties for nourishing kidney and muscle relaxation. Pig’s liver and kidney are always on the lists of things to eat in confinement diet of many confinement nanny as they are good in nourishing body. Pig’s kidney helps in kidney-deficiency and heals lower back pain. Beneficial for treating lower back pain, frequent urination and edema in new mothers. Slit open the kidney and remove membrane. Rub with salt and rinse several times until the water becomes clear. Rinse and cut into slices. Scald in boiling water, and dunk in cold water. Cut pork into shreds and mix well with the marinade. Cut ginger into shreds. Heat sesame oil in a pan and fry ginger until fragrant. Add kidney, pork and Dom Benedictine. Fry briskly and season with light soy sauce to serve. *For breastfeeding mothers, cook the Dom Benedictine for a while to allow the alcohol to disperse. To remove stench, first scald the kidney in boiling water, then dunk in cold water.